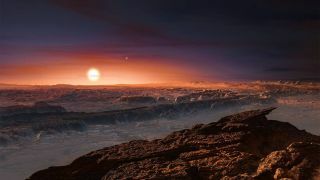 An artist's impression of the view from a rocky world around the M-dwarf star Proxima Centauri, the closest star system to the sun. There are many characteristics that can make a planet inhospitable to life, and new research shows that for some planets, a tilted orbit may be one of those factors. Planets orbiting distant stars may have the right conditions for life if they exist in the so-called habitable zone — a region around the star where the planet will receive enough sunlight so that liquid water could exist on its surface. This temperature range is ideal for the kind of life seen on Earth. But a new study shows that for a planet orbiting a type of small, dim star known as an M-dwarf, the planet's tilt can make the worldinhospitable, even if it lies within the star's habitable zone. The research examined how a planet's "obliquity" — or its tilt compared to the flat disk of its orbit — affected the change in surface temperature. "We find that the climate of planets with higher obliquities is generally warmer than those with lower obliquities," the international team of researchers, led by Yuwei Wang of China's Peking University, said in their paper. Tilted worlds wind up hotter than their upright siblings, evaporating water from the surface farther away from their parent star, compared with worlds with a lower tilt. For those planets, the inner boundary of the habitable zone is moved outward, away from the star. A shift in the habitable zone may seem ideal, as it would move habitable worlds farther away from the frequent bursts of radiation produced by M-dwarfs. However, high-obliquity worlds also freeze faster than worlds with lower obliquities, meaning the outer boundary of the habitable zone also effectively moves inward. The overall result is a smaller habitable zone for highly tipped planets. Scientists say M-dwarfs, which are 10 times more common than sun-like stars, seem to be good contenders for finding potentially habitable, Earth-like worlds. Because they are dimmer, it's easier for scientists to spot planets around them. (The glare from a bright star can drown out any sign of a planet.) And an M-dwarf's typical lifetime — which simulations have shown to be longer than the 13.8-billion-year age of the universe — gives life plenty of time to evolve. But although these stars are dim, they emit significant amounts of radiation. Previous studies have shown that M-dwarfs constantly fire off plasma and charged particles that collide with orbiting planets, creating a hazard for surface life. Scientists continue to debate whether conditions on planets orbiting dim stars could be suitable for life. Enter tipped worlds. While most studies of worlds around M-dwarfs focus on upright planets, Wang's team decided to focus on their tipped cousins. According to the researchers, most studies assume that the effects of gravity from an M-dwarf should pull the planets upright in their tidally locked orbits, where one side permanently faces the star. But the new study points to the moon, which is tidally locked with Earth even though the moon is tipped at 6.7 degrees. "It is entirely possible that habitable terrestrial planets around M-dwarfs may maintain any obliquity between 0 and 90 degrees," they said. To determine the effects that a slanted spin might have on the habitability of a planet, the researchers modeled the atmospheres of such worlds. On planets with an obliquity of 0, their star constantly shines over the equator. When a planet is tipped somewhere between 0 and 90 degrees, however, its star's path changes throughout the year. On Earth, where the angle of obliquity is 23.5 degrees, the shifting path of the sun across the sky results in seasons because the region with the strongest sunlight changes throughout the year. For M-dwarfs, the researchers found that higher obliquities resulted in higher temperatures for worlds very close to the star. Previous studies showed that on tipped worlds orbiting sun-like stars, reduced ice on the surface means less light is reflected back into space, so the planet holds on to more heat. But on tipped M-dwarf worlds, which have very short years, the hotspot is moving constantly, resulting in reduced cloud formation, the new research reveals. Less cloud cover mean less light and heat reflected into space, creating a hotter world than an upright planet in the same orbit, the researchers said. Ironically, the roving hotspot keeps more distant tilted worlds from heating sufficiently at the outer edges, the researchers found. Because the hottest part of the planet is moving constantly, the planet has trouble staying warm and can freeze more easily than it would around a sun-like star, they noted. The new study shifts the outer boundary for habitability for tipped planets closer to the star. "For planets that are orbiting M-dwarf stars, the inner edge of the habitable zone is pushed further away from the star, and the outer edge is pushed closer in," exoplanet scientist Ravi Kopparapu, a researcher NASA Goddard Space Flight Center in Greenbelt, Maryland, told Space.com by email. Kopparapu, who was not involved in the research, studies the habitability of worlds around other stars. "Consequently, the width of the habitable zone is apparently reduced," Kopparapu said. The research's conservative estimate of the inner edge of a tipped planet's habitable zone is about 5 percent smaller than that of an upright planet. If the world suffers from a runaway greenhouse effect — when gases in the atmosphere trap heat that leads to the creation of more gas and thus more heat — the habitable zone could shrink by as much as 20 percent, according to the new research. The research was published in The Astrophysical Journal Letters. The estimated habitable zones of different types of stars (shown as a green band around each star). The different star types: Large, hot A stars (top); sun-like G-stars; and dim M-stars. Planets form in a cloud of gas and dust left behind after their star is born. When multiple worlds orbit a star, they can interact as the pull of their gravity potentially tips a world out of its originally upright position. Collisions can also change a planet's obliquity; scientists suspect that crashing objects may have turned Venus and Uranus on their axes. Although scientists can calculate the tilt of planets in Earth's solar system, measuring the tilt of other worlds is a challenge. According to Kopparapu, measuring the light coming directly from the planet can reveal its obliquity. However, today's instruments do not have the necessary sensitivity to make those measurements. Upcoming telescopes, such as the European Extremely Large Telescope (E-ELT) and the Thirty Meter Telescope (TMT), could reveal the obliquity of exoplanets, he said. The E-ELT, which is currently under construction in the Atacama Desert in Chile, should see first light in 2024. Construction on the TMT in Hawaii ground to a halt due to legal challenges. Shifting back the inner edge of the habitable zone may seem like good news for tilted M-dwarf worlds because it means planets with water should be farther from dangerous radiation. However, Kopparapu said the move is probably too small to make a significant difference. "I think these planets are not going to escape the damaging radiation effects, even if the inner edge moves slightly away," he said. The shift won't be enough to compensate for the blasts of radiation. "What the planet needs — whether high or low obliquity — is some kind of protective shield layer, like ozone for our Earth that blocks UV radiation," he said. A thick atmosphere would help stop much of the radiation from reaching the surface of the planet, giving life a better chance to evolve, Kopparapu added. Because M-dwarfs are so much more active than the sun, and the habitable zones so close, their planets need a thicker atmosphere than Earth's. "Life, if it exists on planets around M-dwarfs, has lots of things to worry about to survive," Kopparapu said. Follow Nola Taylor Redd on Twitter @NolaTRedd, Facebook, or Google+. Follow us at @Spacedotcom, Facebook or Google+. Originally published on Space.com. Editor's Note: A previous version of this article incorrectly stated that a planet with a 90-degree obliquity would have one of its poles permanently facing the parent star. In fact, the star would shine on both poles and the equator at different times during its orbit around the star.